At the age of 33, Michael Vick’s career is coming to an abrupt end. The 2013 season has been a disaster for number seven. Despite a good start, Vick’s turnover problem and more specifically his injuries are pushing him out of football. Unlike most quarterbacks, Vick’s most valuable asset is his leg’s not his arm. When Vick looks back at his career his biggest regret will be not developing his passing game. Instead, Vick focused on breaking breathtaking runs in Atlanta rather than learning the playbook and throwing mechanics. After the dog-fighting incident the Eagles brought in Vick to back up Mcnabb. One year later, he led the Eagles to the playoffs. Now, in 2013, the Eagles realize that instead of investing in a quarterback that could run, they invested in a running back who could throw. Unlike many quarterbacks who can play late into their 30’s, Vick is unique in the sense that he has the mileage of an NFL running back, while other quarterbacks stay in the pocket and not risk injury by running. Whenever you rush for over 5,000 yards in your career, your legs are going to take a beating. The infamous 30 year old wall where NFL running backs start to decline seems to have smacked Vick in the face. With the injuries and turnovers piling up, it only makes sense for the Eagles to move on from Vick after the 2013 season. The Eagles have finally learned it’s almost impossible to build a team around a quarterback who is injury prone and not on the field. Vick hasn’t started in more than 13 games in a single season since joining Philadelphia and has only started 16 games in the past two seasons combined. Let’s face it, he’s not the long-term answer in Philly. Come to think of it, the Eagles aren’t better off with Vick right now. He’s been turning the ball over too much and he is not healthy. When healthy, Vick can be a dynamic player but he hasn’t been completely healthy for a longtime. At this point, Vick can never be truly healthy. Even if he can play a few games, it’s now when not if he’ll get hurt. 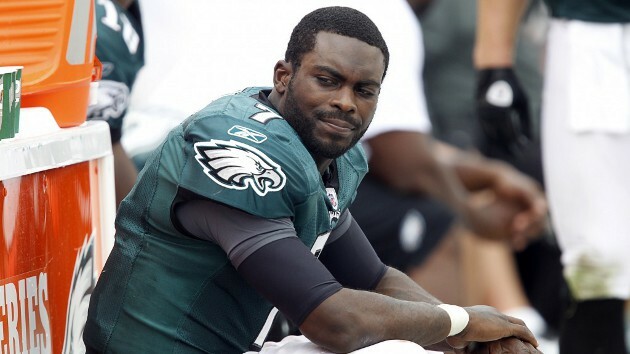 If Chip Kelly wants to get the Eagles going forward not only this year, but beyond, he needs to bench Michael Vick. Instead, Kelly needs to see if Barkley or Foles have the potential to be the Eagles starting quarterback for the next five years. If not, the 2014 Draft offers a deep quarterback class that could have the quarterback that’s the best fit for Kelly’s offense. Despite the trend of very athletic quarterbacks in the NFL today, I don’t see any team offering Vick a starting position next season. At best, he’s a sold backup that if need be can start for a few games. That maybe Vick’s only choice next season. At this point in his career, like most running backs, a secondary role is the best fit moving forward. Looking back at Vick’s potential, it’s unfortunate that we never got to see a fully developed player. Had he developed throwing the ball to go with his explosive legs, Vick could have been one of the most unstoppable quarterbacks in NFL history. I guess now we can only wonder what could have been?